Multiple law enforcement agencies surrounded the suspects’ vehicle on an Interstate road in Martin County, leading to the arrest of three men. 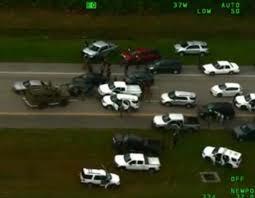 Dramatic aerial footage posted by the Martin County Sheriff's Office shows dozens of law enforcement vehicles arriving on the scene as armed officers apprehend the suspects. According to a federal affidavit, the Palm Beach County men had planned to rob an armored truck enroute from a large bank run at a PNC Bank in Port St. Lucie. The suspects had mapped out a plan to steal millions of dollars before shooting and killing the two employees in the truck. Following that robbery, the suspects intended to carry out a second deadly robbery, targeting another armored bank car. Details of the heist were divulged to an FBI informant who was instrumental in leading to the takedown, TCPalm News reported. Evidence gathered by the FBI Safe Streets Task Force, a multi-agency unit specializing in violent crimes in South Florida, was enough to develop probable cause and sanction a special takedown operation. The long-planned robbery and murder plot was foiled on February 20, but footage was only released on Thursday. The three suspects remain in federal custody.